Have you ever wondered how the Amazon algorithm works? I went and interviewed the CEO of Viral Launch, Casey Gauss. 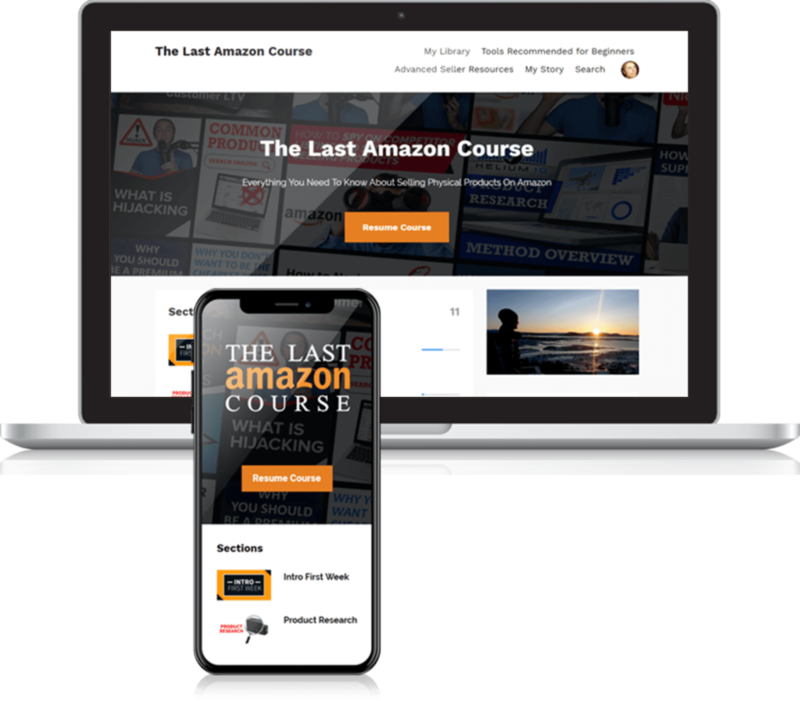 He has probably the absolute best firsthand experience of the Amazon algorithm because he's been involved in over 30,000 Amazon product launches. He gets to see the data of what works and what doesn't on a daily basis, maybe the only people that have got better info or insiders working at Amazon. This is going to be the best shot we get at learning it. We're going to cover things such as how does the algorithm work? What keywords do you need? How do keywords work in the Amazon algorithm? How do you rank for keywords? Does it matter how long your listing has been alive? Does it matter how long of sales history? I hope that this helps you understand the Amazon search algorithm a little bit more because knowing how the algorithm works will make or break your success because that's the only way people are going to find your product. Q: Do you know how much percentage comes from organic sales from the search bar? No, it's so hard to tell because sometimes, if you're ranking in not running ads, you can't attribute 100% of sales there because maybe Amazon is running some marketing campaign or re-targeting someone that viewed your listing. It's so hard to tell definitively where results are coming from. Q: Do you got to get on the first page to make sales? When you buy stuff on Amazon, assuming you do, how are you finding that stuff? You're going into the search bar, you're searching with what it is and you're buying it. Q: How do you think that the Amazon algorithm works? How does the algorithm decide which ones to choose when you type in a keyword? In e-commerce setting, the algorithm is largely concerned with ‘How can I drive more sales?’ That means making money. That means someone is getting out their credit card and paying for something. This is the biggest indicator of relevance. In Amazon, their algorithm is concerned with relevance to a keyword. So again, the largest distributor of relevance is a sale. So, if someone searches ‘fish oil’ and they saw a ‘grill brush’. They’re not going to buy that grill brush because that's not what they're looking for. They're looking for ‘fish oil’. If a customer searches something and then they buy something, that's an indicator to Amazon that “Hey, this is what the customer was looking for.”, which is a ‘fish oil’ a.k.a. a vote of relevance. The biggest driver of keyword ranking on Amazon is sales. I touched on it briefly, but I think Amazon is concerned with sales history, not just sales over the last day or the last hour. You’re paying attention in these buckets of 24 hours, 48 hours, 3 days, 5 days, 7 days, and then the seven-day increments. I think that the sales history probably goes out to at least 180 days in Amazon is tracking. What this means is, let's say you had a product that has been live for the last year. Over the last six months, it just hasn't been performing very well. Maybe selling two units a day on average, let's just say. Competitors that have been selling 50 units a day, their sales history over the last six months is awesome. Six months on average selling 50 units a day. It was a very strong versus your five units a day. Assuming you have this bad sales history, we find it a little bit harder for you to achieve ranking and maintain ranking. Q: Are you saying if you've sucked for a while then it's going to be hard for you to get on the first page? You might want to do a relaunch? A relaunch, but what you should take into account is how many reviews do you have on that old product. Because if you have a good number of reviews, 100 reviews, 200 reviews, it's kind of hard to drive reviews right now. Q: Would you just add a variation? Yes, you can define it. What you should definitely pay attention to is when you first launch a product. Amazon gives this fourteen-day like star power. Essentially, in those first few days, Amazon really pays attention to the sales. Any sales driven through that are 1.5 next in terms of relevance. Q: In the first two weeks can you get more weight? We find it a lot easier to drive ranking. You don't need to drive as many sales. We see your ability to maintain rankings so much better. We’ve had plenty of instances where, maybe someone doesn't have that great of a product or that great of a listing, maybe not that great review. In that first two weeks we launch it and it maintains ranking for like months, months and months, even though it's not selling well because it has bad photos or bad review quantity. But, they're able to maintain that ranking because they performed so well in that first two-week period. I think Amazon gives it a little extra love to see 'let's get this listing and chance. Let's see how well it performs.' If it performs well in the first two weeks, I'm assuming Amazon is like, "Wow, this must be good if they are doing this well right off the bat." we definitely see an advantage in the first two weeks. Q: Where should people be choosing to put their keywords? We've done a lot of analysis around. Every one of our 30,000 product launches for tracking the keyword structure or the content of a listing to understand and then tracking each of those keyword phrases in the search results to see how sales interact with those words of that keyword structure to drive ranking. Amazon puts a lot more weight on your products title when it comes to ranking. We think that Amazon pays more a greater amount of attention to the words at the beginning of your products title. Let's say you have a ‘fish oil’, include ‘fish oil’, ‘mega three’, all these high volume words in your title. To a large extent, we're almost keyword stuffing our titles to make sure that we have just as many high volume keywords in our title. We try to make sure that it's cohesive. It’s still readable. But sometimes, it may be a little bit quirkier. It has a couple little quirks. One thing that I like to say is I would rather have 3% lower click-through rate, but rank for twice as many key words. I'll give up the cohesion or that beautiful sales language in my title to make sure that I'm ranking for two times as many keywords or three times as many keywords. So, I'm going to get so many more impressions. Even though my conversion rate is a little bit lower, I'm driving so many more impressions and I'm driving so many more sales. Q: At a fundamental basis, do you believe that you get a lift for every keyword in your title when you make a sale? Yes, I do. In your listing, and I think title just gets that much more. Q: Could you almost rank for something that's kind of irrelevant by just getting so many sales, but the word was in your title? Yes and no. it depends on the category. I think that Amazon is doing a little bit more of this, but not to the degree that some people think. Latent semantic indexing, they build these key word clusters of relevance. If ‘fish oil’ has this kind of keyword cluster and ‘dog cages’ so far outside of that, I think that Amazon sees your listing as ‘fish oil’. I do think you could get Amazon to now start thinking that this listing is a ‘dog cage’, but it would take a bit of work. You'd have to make sure that you're still running sales through it. It’s kind of a roundabout way of answering your question. Yes if it's closely related. If it's not, then sometimes we find it hard to do. Q: Do they know what words are correlated to each other to a certain extent? We don't see that you need to have exact phrases in your listing. If you have ‘fish’ and ‘oil’ in your title, you do not have to say ‘fish oil’, ‘fish oil omega 3’, ‘fish oil or pills’. We do try to do phrase order. It would be like 'fish omega 3 oil'. So then, you still have 'fish oil' in phrase order versus having 'oil fish'. But again, I think these are small improvements or optimizations versus like if you have it in the title, you're good to go. Another thing that I talked about is you definitely need to have the plural forms of your words in the title. Looking at ‘grill brush’, let's say you're selling just one brush. You definitely have ‘brushes’ in your title as well because if you are getting a lift for each word in your title, you need to get lift for ‘brush’ and you need to get lift for ‘brushes’ because Amazon treats them differently. If you want a quick anecdote, we pushed something very similar. I'll continue to use the brushes example, but we ran a launch for a product that only had the plural form in the title. We ran a launch targeting the singular form. So, we targeted ‘grill brush’; that ‘grill brushes’ in the title. We only got the single form to mid-page 2 and we're like, "What the heck is going on?" We would expect it to hit page 1. But if we go and search the plural form, we saw that ranking really well on page 1 in the top 10. It was because it had it in its title. Even though we're not running a launch to it, Amazon was giving it lift because it was found in the title. Q: Did you have ‘brush’ and ‘brushes’ in the title? No, but you should. In this example we only had the plural form and that's why it was hitting on page 1 and not the singular. Q: When you're doing your keyword research, sometimes if you have ‘brush’ and ‘brushes’ or you just have one of those, you will rank for both of them, you'll be indexed for ‘brush’ and ‘brushes’, but if you're going to do a launch or try to rank, you need to have ‘brush’ and ‘brushes’ to start to rank for those in the keyword search? Yes. I think that's an important concept. Let's say brush and brushes. It's just because you're indexing for both does not mean you're driving the same amount of ranking power for both. I think backend search terms, if you want me to mention that. Q: Where does the Amazon algorithm care about backend keywords? There's only 2000 characters available in your description, 500 on average for your bullet points, 100 each bullet point and let's just say 100 in your title. So that's only 2,600 characters available in the front end of your listing and then 250 in the back end. So, 2,850 characters are available. That’s not that much space. You also need a lot of these words like 'the' and 'and', words that help in the overall cohesion. You definitely have to be choosy about which words you are placing in your listing. Basically the way that we do it is most important words in the title and then the words that we have yet to include, then go into bullet points while still providing some beautiful phrases. The trick is how can I beautifully marry sales inducing language with the keywords that need to be in there from SEO perspective? If people aren't finding your listing, it doesn't matter how beautifully written it is. Then we go to the description. For the backend search terms, usually that backend search terms don't have any of these words like 'fish' and 'oil' or anything like that. It's just the collection of words that we weren't able to put it into the front end of the listing. Maybe it didn't make sense. Maybe we only sell like a ‘green grill brush’. But, we want to rank for the words like black and red or something like that. It wouldn't make sense to put it in the front, so we'll include it in the backend. If we write a cell phone case listing, you'll not see 'cell' or 'phone' or 'case' in the backend. It's all these words that we weren't able to include in. Q: Is there any difference if we put the keywords in the description versus the bullet points versus the backend keywords? Yes, I imagine there's some kind of difference. Normally, we treat the bullet points as kind of second order then description, then backend search terms. I think the difference is probably so subtle that it is very difficult for us to discern definitively. We don't have strong data that shows us either way. There are so many different things going on. There’s so much noise. It's hard to understand things like definitively, unless there's like a major difference, which we see in the title. That's why we know the title is more important. Q: If you had to sum it all up, what is the most important part about the algorithm? Just make sure that you're driving sales. Make sure that you have a listing where you have as many main keywords in your title as possible. You on't need to use phrases, just make sure it's in there at least one time. That is the basic way. Most all sales on Amazon come through people looking at this search bar. They look at that and then they look up keywords. You're going to get a lot of sales on your product through many different keywords. When you launch a product, Amazon uses machine learning algorithms and it will test you on keywords that are in your listing and that it thinks are relevant based off of the info you've given them. Based on how you perform, if people click when they see or whatnot, and if they buy, it now learns if that key word is good for your product or not. How does it learn? The most important thing basically is sales. If you get sales through a keyword, you're going to rank. Essentially, whoever's getting the most sales through a keyword, Amazon shows. That's just the way that the entire search algorithm works. Your goal is to find the right keywords for your listing. You get a lot more sales than your competitors through those. And then, you rank higher. That's the whole name of the game. Amazon uses sales history to determine which keywords that you're going to rank for. It's not just if you did good one day or three days or five days. It matters all these different time buckets. When you launch, it's testing and learning. If you do really good in those first 14 days, you over index. Amazon gives you extra love because it's like, "Wow, this product came out and it's just crushing everybody else." Then you'll stay ranking for higher than you should have. Your overall job is just to find the keywords that are the best for your listing. Now you're wondering. Let’s say you find out all the keywords. You need a keyword research tool to do that. I suggest you either use Viral Launch or my favorite is Helium 10 for keyword research, but they're both good and they both get the job done. I have videos for both, for keyword research coming out here. It's in the $1 Amazon course now. Keywords - whenever you get a sale on your listing, you basically get a lift for every keyword in your title. You don't want to duplicate keywords. So don't do 'fish oil pills', 'fish pills oils'. Just have the word fish once. Try to get phrases in there if you can, but if you can't, it's not the most important. The stuff that you can't fit in your title, but you still want to use these keywords, just put it in your listing somewhere. Maybe it gets a little bit better, little bit better ranking from the bullets, but it's so statistically unmeasurable that it really won't make a difference. The 80/20 of your listing, you just need to find the right key words that people are going to buy through and get sales through those. At the end of the day, that is literally all you need to know. Find keywords, get sales through those and optimize for those. If you convert really well on a keyword that has high traffic, put those words and you're at the top of your title, tailor that product listing to the keywords that convert the best. And then boom, you have a successful product. There are the basics of the Amazon search algorithm. It's all based off keywords that people are searching and finding the right keyword match for your product. Click Subscribe To Stay Up To Date!